Saturday November 11th 2017 will be the date of our 6th Annual Fall Martial Arts retreat. This seminar series has been an overwhelming success. 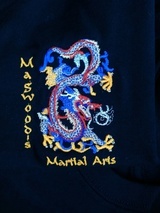 A fantastic day of martial arts training and martial arts family spirit. It has brought Martial Arts practitioners of all levels and styles together in a spirt of sharing the riches that the Martial Art have to offer. I am happy to once again be working with Sensei/Sifu Terry Langevin at this years retreat. An exceptional teacher and practitioner he connects with his students and passes on his excitement for his art. I am excited to welcome Sifu Simon Chong of Internal Harmony Kung Fu to this years event. Sifu Chong has fantastic skills in both teaching and technique and a life time dedication to the martial arts. From beginner to seasoned practitioner you are sure to come away excited to train and with lots of new material to work on. 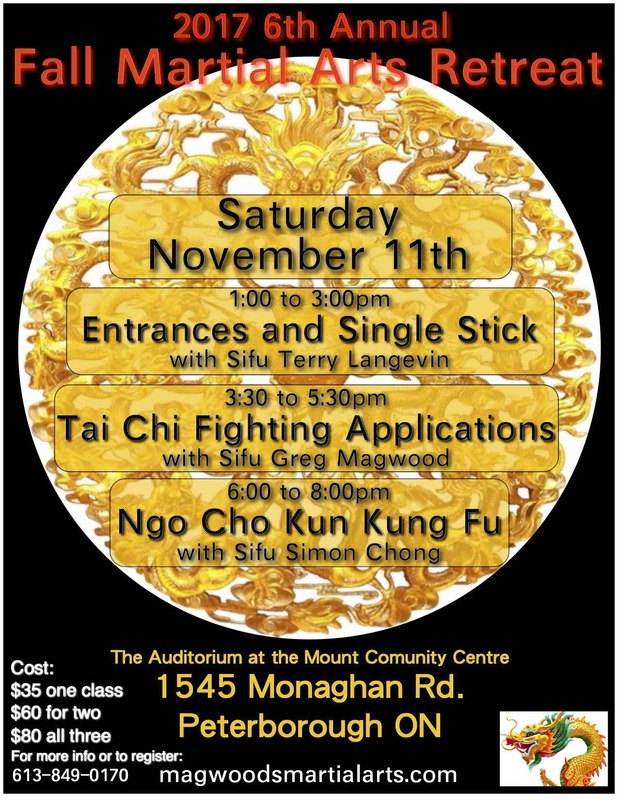 3:30 to 5:30pm - Tai Chi Fighting Applications with Sifu Greg Magwood. Balance and structure are paramount to effective martial arts, explore Tai Chi Chuan's sophisticated bio mechanics and watch your skills grow in all other systems you train in. 6 to 8pm - Sifu Simon Chong, Ngo Cho Kun, 5 ancestors fist. A southern shaolin style. An internal external mix. Based on Lohan monkey crane tai chi and tat chun. It's considered one of fukien province's best combat systems. The root art of Goju Ryu Karate, it's mostly practiced in southeast Asia. The retreat is open to students all levels from any martial arts background and encourages an open atmosphere where students work together to explore the material offered. It's surprising how nice people can be with each other while learning something so potentially dangerous.